The Seattle Department of Transportation (SDOT) has partially closed the intersection between Nickerson Street and 15th Avenue West. This is the complex intersection at the south end of the Ballard Bridge. This is the final phase of the city's Nickerson Street repaving project. Weather permitting, the closure is scheduled for October 5th until October 22nd. In the graphic above, routes A, C, and E will be open Monday - Thursday and will be closed at other times. All other lettered routes above will be closed for the entire period. Connections not lettered above will remain open at all times. King County Metro Bus #29 and 31 will be rerouted from W Nickerson St to 14th Ave W and then to W Dravus St, intermittently. To accommodate this, street parking on 14th Ave W will be suspended temporarily. 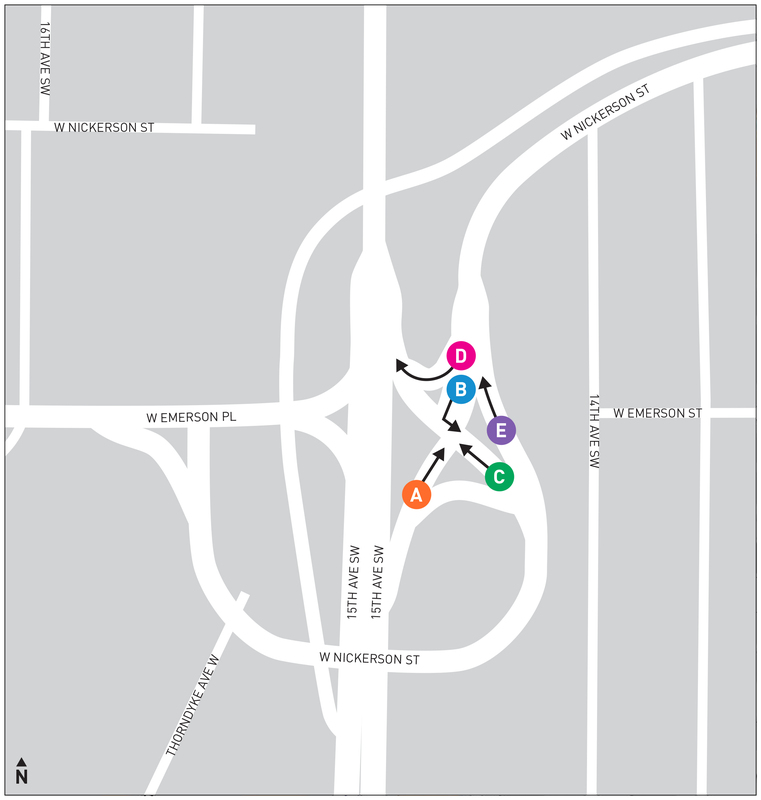 For further information, including the official detour routes, please refer to SDOT's website on the project.